I started this blog four years ago and my first post was about how hedge fund returns have been correlated with stock returns. That correlation hasn’t changed. That’s because hedge funds and stocks are all part of the risk trade. Hedge funds take risks and so do stock investors. In the current environment where the market oscillates between “risk-on” and “risk-off”, it’s not unexpected that hedge funds returns be correlated with stock returns. The chart below shows the returns of the HFRX Global Hedge Fund Index, which is a representative index of all investable hedge funds, compared to the S+P 500. Even though hedge fund returns were correlated to the S+P 500, the above chart shows that they tended to be less volatile than the S+P 500. What that means is that when stock returns are down, hedge fund returns should be counted on to be down less and beat stock returns. In 2011, the chart below shows that they didn't and lagged the S+P 500 instead. A funny thing happened in 2011. First of all, hedge funds had a terrible year as they substantially underperformed the S+P 500. On a year-to-date basis to December 16, 2011, the HFRX Global Hedge Fund Index was down -9.0% after fees compared to -1.3% for the S+P 500. The negative performance occurred across the board. The chart below shows the YTD returns of the various HFRX sub-indices. The Global Index was down 9.0%, but every single category of hedge fund returns underperformed the S&P 500. The poor performance of hedge funds in all categories is illustrative of the headwinds faced by active managers in 2011. Nothing worked! Two categories that performed particularly poorly were directional strategies, namely Market Directional and Equity Hedge, which allowed a manager to go long or short. Fundamental Value was the laggard at -23.6% for the year. The carnage in hedge fund performance can be seen anecdotally from the headlines. John Paulson's Advantage Plus flagship fund's performance through December 16 is down -9% in December and -52% on a YTD basis. Legends like George Soros exited the business of managing money to focus on his own funds. I could go on, but you get the idea. I am working on a much longer post analyzing why hedge funds performed so poorly in 2011. More on than later. What happened? The ECB throws a party but no one shows up? There are a number of plausible explanations for the market reaction, but they could amount to little more than rationalizations. First, the EBA effectively nixed the carry trade by requiring banks to mark-to-market, so much of that €489 billion amounted to liquidity injections into the eurozone banking system. If the banks need that much liquidity, what could they be hiding? Or does this just show that the European banking system is just getting by on ECB life support? Roughly €300bn of today’s eagerly awaited LTRO tender is recycled old money from earlier support operations. The new money is €200bn. This alone is not going to shore up the sovereign states of southern Europe as they grind deeper into recession/depression. He wrote that European banks need to shore up their Tier 1 capital base to the tune of "€2.5 trillion adjustment according to the BIS’s Global Stability Board". In addition, "Eurozone sovereigns must raise €1.6 trillion in 2012, and banks must raise another €700bn." The LTRO was a liquidity injection operation that took a Lehman-like event off the table. Maybe the markets are now finally focusing on what typically matters, such as earnings, growth, interest rates, etc. and it didn't like what it saw? Indeed, Christine Lagarde of the IMF warned emerging market economies to prepare for a downtrun in Europe. Putting on my technician's hat, I would say it doesn't matter what the explanation or rationalization is. The market's inability to rally on good news, namely €489 billion in QE from the ECB, has to be interpreted bearishly. When I look at the one-year charts of most markets, I see the charts mostly forming triangles indicating indecision. The direction of the next break will likely determine the next intermediate term move. This chart of ACWI representing the All-World Index is a typical example. The commodity sensitive Canadian market is also not behaving well. The Chinese market, as represented by the Shanghai Composite, has broken down decisively and is in a well-defined downtrend. In sympathy, Hong Kong experienced a downside break in its triangle in the last week. India isn't behaving well either. The South Korean KOSPI experienced a downside break recently, but that could excused because it could be viewed as a special case of a market reaction to geopolitical tensions. To be sure, the picture isn't entirely bearish and there are a couple of bullish data points. The Brazilian market rallied above a downtrend line in October. The Australian All-Ords Index is showing a similar pattern of broken downtrend and sideways consolidation. Both Australia and Brazil are major supplier of resources to China. So these chart patterns must be regarded as somewhat supportive that a hard landing may not be in the cards for the Middle Kingdom. However, the weight of the evidence suggests that while the trend breaks have not shown up definitively, the bias for the next intermediate term move is to the downside. The markets have been anticipating the onset of QE3 by the Federal Reserve. Indeed, Deutsche Bank believes that the market has already discounted $800 billion in QE3 purchases, which is anticipated to be concentrated in Mortgage Backed Securities (MBS). Recall how the focus on MBS came about. QE2 involved $600 billion in the purchase of Treasuries, which pushed down the Treasury yield curve, flooded the system with liquidity and prompted investors to take more risk. The net effect of QE2 was to push up stock and commodity prices, but didn't do very much for the real economy. In effect, it found that it was pushing on a string. In response, the Fed wanted to concentrated on risk premiums where it mattered, such as mortgage rates, in order to stimulate the housing market. Thus the impetus for QE3 was born. Target MBS, it was said, and you will push down the cost of home ownership and stimulate housing. The European Central Bank is currently conducting a Great Experiment with its LTRO (Long Term Repo Operation), where it is offering unlimited amounts of three year liquidity to banks, collateralized by paper with credit ratings as low as Single-A. There was some hope that LTRO would prompt banks to put on the carry trade. Borrow from the ECB at 1%, buy PIIGS debt at 5% or more and earn the carry (see my discussion of LTRO here). The banks repair their balance sheets. The sovereigns get access to loans. Everybody wins! Simply put, back in the pre-crisis days the two markets worked in tandem. Participants engaging with the ECB did not differentiate on the type of collateral they delivered to the ECB versus the type of collateral they held back for use in private funding markets. 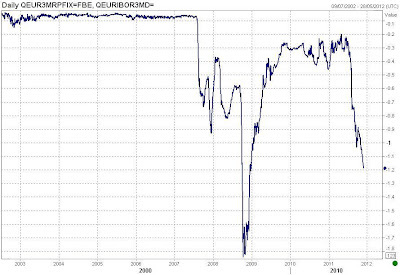 The crisis changed all of that.Suddenly the cheapest collateral to deliver became the collateral of choice for ECB use. The most expensive or ‘quality’ collateral was held back for use in private markets. This is how central bank transmission mechanisms began to be compromised. The private funding markets, dictated by interbank participants, could from now on only be influenced by large quality collateral holdings — which the central banks increasingly lacked. The public funding market, dictated by central banks, became the domain of trash collateral — which no one really cared about. The central bank monopoly on the ultimate cost of money thus became based around access to trashy collateral, not quality collateral — which remained the preferred funding option for private markets. Unfortunately, it’s private liquidity which ultimately determines the scale and depth of the eurozone crisis — and it’s in this market where ECB influence is waning. In other words, you take your junk lower quality paper to the ECB and you reserve your high quality collateral (e.g. bunds) for the private repo market. The problem is that the private repo market continues to seize up because of a lack of high quality collateral and a rising sense of risk aversion over counterparty risk, i.e. you don't trust that you are going to get paid back so you demand really, really good collateral. Private markets must be convinced to lend unsecured or invest money in more than just the last few remaining AAA bond markets. But as they say, you can lead a horse to liquidity but you can’t make it drink. Which is a shame, because that’s the main problem the ECB and other central banks are now facing: they are leading banks to liquidity but they can’t make them lend in private markets. The ECB's experience with LTRO should be a cautionary tale for the Fed as it considers a QE3 program of purchasing MBS. You can lead a market to liquidity, but you can't make lenders lend and borrowers borrow. Beware of unintended effects, Mr. Bernanke. The coordinated central bank actions of November 30 to inject liquidity into the global banking system shows that central bankers are worried. No doubt, they learned from 2008. In the short term, liquidity ensures that a major bank failure or Lehman-like failure in the shadow banking systems is off the table and will not bring the global financial system down in a market crash. Key Risk: The system isn't totally healed. These actions just bought some time for the politicians to act. Indeed, Bloomberg reported that Ben Bernanke, in a closed-door briefing to Republican senators, made it clear that there are limits to Fed policy and it doesn't intend to bail out European banks. Debt tolerance has decisively turned. The initially well-founded optimism that launched the decades-long credit boom has given way to a belated pessimism that seeks to reverse it. Excesses of leverage are dangerous, in part because debt is a particularly inflexible form of financing. Unlike equity, it is unforgiving of miscalculations or shocks. It must be repaid on time and in full. While debt can fuel asset bubbles, it endures long after they have popped. It has to be rolled over, although markets are not always there. It can be spun into webs within the financial sector, to be unravelled during panics by their thinnest threads. In short, the central relationship between debt and financial stability means that too much of the former can result abruptly in too little of the latter. Hard experience has made it clear that financial markets are inherently subject to cycles of boom and bust and cannot always be relied upon to get debt levels right.7 This is part of the rationale for micro- and macroprudential regulation. It follows that backsliding on financial reform is not a solution to current problems. The challenge for the crisis economies is the paucity of credit demand rather than the scarcity of its supply. Relaxing prudential regulations would run the risk of maintaining dangerously high leverage—the situation that got us into this mess in the first place. 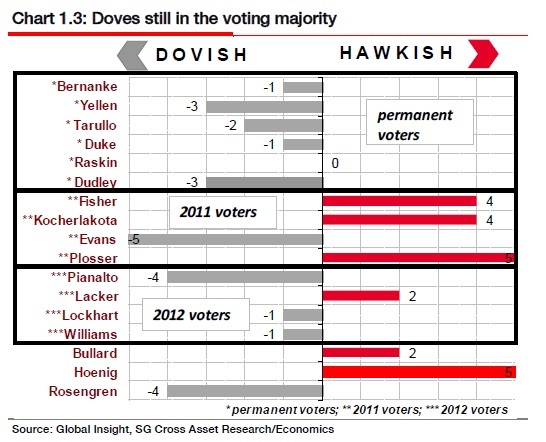 Could the Fed still save the equity markets in 2012? 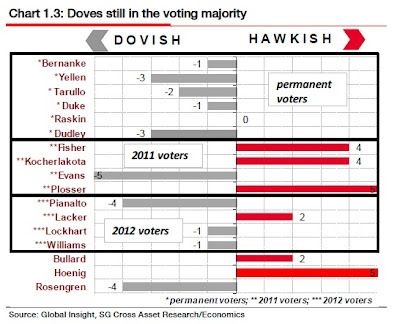 Cardiff Garcia of FT Alphaville pointed out this analysis from SocGen showing that the composition of the FOMC is going to turn far more dovish in January 2012. Central banker statements are very measured. Yellen's speech about additional purchases is a definitely signal that QE3 is coming. Key Risks: We are now in a world of bad news is good news for the markets and good news is bad news. Economic growth has to show that it is indeed deteriorating before the Fed can act. The calls by the likes of ECRI and John Hussman for a recession have to be wrong. The high frequency data is showing the economy is definitely not keeling over. Assuming that ECRI is right, when will the data be convincing for the Fed to act? Would a two month extension of the payroll tax cut for two months just extend the pain? 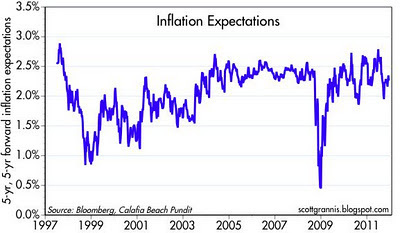 Moreover, this chart from Scott Grannis shows inflationary expectations are still stubbornly high and rising. The Fed is unlikely to undertake QE3 unless inflationary expectations (and not just inflation) remain elevated. The Sarko carry trade saves Europe? Students of market history will recall the policy of forebearance that saved the US banking system during the LDC (Less Developed Country) loan crisis of the early 1980's. After the banks lent to all manner of LDCs that went bust, the authorities pretended that the loans that were on the banks' books remained good for 100 cents on the dollar. At the same time, the Fed began to lower rates in August 1982 and signaled to the banks that they would continue to stay low or continue to fall. Thus, the banks could borrow short and lend long, which repaired their balance sheets over time. The ECB's long term repo operation (LTRO) announced on December 8 did just that. The ECB announced that it would provide unlimited amounts of liquidity via LTRO and relaxed the collateral requirement for LTRO all the way down to anything rated single-A. Nudge-nudge-wink-wink. If you are a troubled bank, you can bring your *cough* junk, borrow from the ECB for up to three years at 1%, put it into Spanish or Italian debt at 5-6% and earn the spread. If you used leverage, it wouldn't take long for you to repair your balance sheet. French President Nicolas Sarkozy said the ECB’s increased provision of funds meant governments in countries like Italy and Spain could look to their countries’ banks to buy their bonds. “This means that each state can turn to its banks, which will have liquidity at their disposal,” Sarkozy told reporters at the summit in Brussels. The ECB is precluded by mandate from lending directly to sovereigns. LTRO is a backdoor way of doing QE by lending to the banks which then lend to the sovereigns - and the amount is unlimited! It kills two birds with one stone. It repairs banking balance sheets and addresses the solvency problem and it allows sovereigns access to the markets. The details of how the ECB means to relax collateral have not yet been released. The Bank currently accepts collateral rated as low as A-, although debtors must pay a penalty based on asset risk. Were even riskier assets allowed to be used as collateral or if the penalty were dropped, this would provide significant incentive for banks to purchase sovereign debt, particularly given currently high yields on bonds. If it worked, it would be the ultimate carry trade—borrowing from the ECB is now a cheap 1%, so banks could see huge returns on sovereign debts with high yields. Supposing that a bank uses the LTRO facility and puts up Spanish paper as collateral. Soon afterwards, Spain is downgraded by the rating agencies. Under the terms of the facility, the ECB would ask the bank to put up additional collateral as a "margin call" because of the credit downgrade. Second, one of the legs of the policy of forebearance is to allow banks to carry doubtful debt at book value and market it to market. If they were the required to mark-to-market, then the bank could be deemed insolvent and would either need to be liquidated, merged with a stronger partner or nationalized. The European Banking Authority (EBA) has recently become progressive tougher on European banks in its stress tests and began to raise its standards from a ridiculously low level (recall that Dexia was declared healthy with a Tier 1 capital ratio of 12% just before it imploded). The EBA stands in the way of this forebearnce trade. Will the EBA play ball? Can Berlin and Paris twist enough arms at the EBA to get them to come onside? That view echoes comments from UniCredit chief executive Federico Ghizzoni, who this week told reporters at a banking conference that using ECB money to buy government debt “wouldn’t be logical”. The bank had traditionally been one of the biggest buyers of Italian government bonds, with almost €50bn on its books. From my viewpoint, the most important technical consideration for the "Sarko trade" to work is the cooperation of the EBA. It will have to happen in very large scale for it to have an impact. I wrote last week that if you put "all the major eurozone countries together, they need to roll over €1.8 trillion in 2012, or 19% of estimated GDP." That's a lot of money. Moreover, the "Sarko trade" will only work if there are no accidents along the way. There are some key elections coming up in 2012, namely Greece, Italy, Finland and France. In particular, will the new governments in Greece and Italy cooperate with the EU? How badly will austerity bite in eurozone? Can they prevent a European bank failure despite their best efforts? If not, would its effects cascade through the banking system? What about China, will it avoid a hard landing? That's the trouble with the all-in bet-the-farm trade, if it goes wrong (and plenty of things can go wrong), you're dead. The US economy and inflationary expectaions have to weaken sufficiently for the Fed to underatke QE3. The EBA has turn a blind eye and moderate its mark to market rules for bank debt. Market analysis isn't just about having a single view, but about scenario analysis and the assessment of the probability of those scenarios. How you decide about the likelihood of these events will determine whether you are a bull or a bear. Last week in Kansas City, one of our long-only accounts was especially concerned that the Endgame scenario is upon us. We discussed the best way to preserve capital in such a calamitous environment. The conclusion was to load up on the US dollar and US Treasury bonds, the scenario that seems to be working so far this week. Let's go to the data. 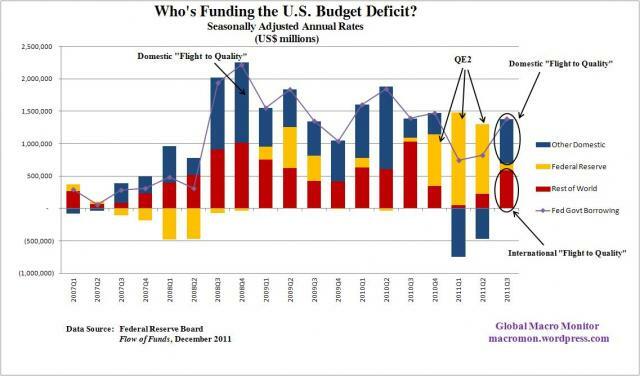 Global Macro Monitor showed this chart of who is funding the US deficit. While the latest data shows that there are certain a lot of fund flows into US Treasuries from domestic and international investors, levels are similar to levels seen in 1Q 2010 and below the panic levels seen in the 3Q and 4Q of 2008. What about hedge funds? These charts from Mary Ann Bartels of BoA/Merrill Lynch shows that large speculators, or hedge funds, are nowhere near a crowded long in the long bond. What about the 10-year note? This chart shows that while large speculators have been buying the 10-year note, they are also nowhere near a crowded long. This chart below shows the relative performance of the 30-year Treasury ETF against SPY. Again, it shows that while long bond returns are somewhat stretched relative to equities, relative performance levels are similar to the levels seen during the Summer of 2010 and far below the end-of-the-world levels of the Lehman Crisis. Conclusion: While investors may be rushing into US Treasuries, the safety trade is nowhere near a crowded long, which indicates that risk-off trade has more room run. It's been a while since we've had a "China is slowing" scare, but we may be due for one. The chart of the Shanghai Composite shows that the index violated a key support level last night, which is an indicator of heightened stress. The chart of the Hang Seng Index also shows that it violated a key support level in September and attempted a failed rally above the support-turned-resistance line. The index is now testing the bottom of a triangle formation, while investors wait for either an upside or downside breakout as an indicator of near-term direction. Home prices nationwide declined in November for the third straight month, according to an index of values in 100 major cities compiled by the China Index Academy, an independent real estate firm. Average prices in the Shanghai area are down about 40% from their peak in mid-2009, to about $176,000 for a 1,000-square-foot home. Sales have plummeted. In Beijing, nearly two years' worth of inventory is clogging the market, and more than 1,000 real estate agencies have closed this year. Developers who once pre-sold housing projects within hours are growing desperate. A real estate company in the eastern city of Wenzhou is offering to throw in a new BMW with a home purchase. According to the China Real Estate Index, published by Soufun.com, the average primary market housing price across China’s top 100 cities dropped for the third month in a row in November, by 0.3% month-on-month, with prices in 43 cities still rising and 57 cities falling. However, other real estate agencies reported steeper drops in specific locations. Homelink said that in November alone, primary market prices in Beijing dropped 35% month-on-month, and industry sources told the Legal Evening Post they dropped 16.8% week-on-week in the last week of November, down 29% year-on-year. According to Caijing magazine, Beijing home sales volume (by area) in the first 11 months of 2011 was down 27% year-on-year, to a 10-year record low. A similar fall-off was evident in commercial as well as residential real estate. According to the Beijing Morning Post, sales volume for retail and office space in the capital dropped 18% and 7.4% respectively in October, month-on-month. Homelink’s chief Beijing analyst, Zhang Yue, told the paper he saw a growing supply glut developing. The downturn was not limited to Beijing. Dooioo, another agency, said that primary housing sales volumes in Shanghai are the worst since 2006, while Chinese Business News reported that in Shenzhen, primary prices were down 10.7% and transactions down 11.3% week-on-week in the last week of November. Business China also reported a drastic drop in sales, despite generous discounting. How investors in the secondary market will react to the collapse in primary market prices is the biggest question of all. As I’ve mentioned many times, many people in China buy multiple units of housing in order to hold them empty indefinitely, as a form of savings. They do this because they have few attractive alternatives and because they have faith that housing prices will go up. Since many have paid cash, they aren’t under the same immediate pressure to sell as developers. But they do tend to look to rising primary market prices for assurance that their investments are profitable and safe, and now those prices are now plummeting. A great deal depends on whether they hunker down to weather the storm, or join the fire sale. He does caution, however, that even though many apartments are paid for in cash, there may be other forms of leverage in property purchases. Depending on how pervasive the level of financial leverage, sales could create a cascade of falling Chinese property prices. Beijing-based blogger Bill Bishop recently related the story of an email he received, which makes equally interesting reading. It came from a real estate agent representing a condo owner in one of the city’s top apartment buildings, in the Central Business District (CBD). Although he had no mortgage, and owned the unit outright, he was desperate to sell in order to raise RMB 20 million for his business. So it’s worth keeping in mind that, while many Chinese investors may not be directly leveraged on their real estate investments, given the credit explosion that has driven the Chinese economy these past few years, they may be highly leveraged in their business or other ways that could turn them into distressed sellers. As the world has focused primarily on Europe and secondarily on the United States, my sense is that the consensus is that China will escape a hard landing. While I am of the belief that China should survive the next economic downturn in relatively good shape, stories like these will serve to heighten investors' sense of emerging market risk. In addition, we are seeing stories about India slowing as well. Should European or American economies get into serious trouble in the months to come, there may not be any place to hide. Depending on the score changes, if any, that our rating committees agree are appropriate for each sovereign, we believe that ratings could be lowered by up to one notch for Austria, Belgium, Finland, Germany, Netherlands, and Luxembourg, and by up to two notches for the other governments. Now that the EU Summit has come and gone, what now? The effects of the "fiscal compact"
What about Portugal? The only silver lining is that things don't deteriorate as badly as Spain under these assumptions. Italy, the biggest Club Med country of all, doesn't fare all that well either as its debt to GDP gets out of control rather quickly. The problem of Italy lays the groundwork for another eurozone crisis in the near future. What about France? Oh, dear! It looks like Sarkozy is likely to lose his precious AAA credit rating. The only country that fares reasonably well under these revised assumptions is Germany, whose debt to GDP ratio continues to contract. Even then, its deficit to GDP measure won't be below the magic 60% target, which would suggest further fiscal tightening under the terms of the "fiscal compact". This analysis indicates that the fiscal balance of major eurozone countries will deteriorate under the terms of the new "fiscal compact", which leads to the conclusion that a wholesale downgrade of many eurozone sovereigns is very likely. The next question for me was, "How much more risk would a credit downgrade introduce to the eurozone?" In his article, Voss showed the likely rollover of debt as a percentage of GDP for all eurozone countries. I then went to the IMF website and looked up the projected 2012 GDP by country to calculate the projected rollover figure for 2012. Italy is one of the more problematical as it is scheduled to rollover over €300 billion in 2012 (even this estimate may be low as others have cited a figure of €440 billion). Surprisingly, France will need to come to market with nearly €400 billion and the German rollover comes close to €600 billion. If you include all the major eurozone countries together, they need to roll over €1.8 trillion in 2012, or 19% of estimated GDP. Supposing that we assume that Germany will have no trouble rolling its debt and excluded her from 2012 financing needs, then the eurozone debt market will see roughly €1.2 trillion in sovereign debt issues - an astoundingly large number. The PIIGS alone will need to finance about €700 billion next year. These are very large numbers. Given that European banks are in the process of shrinking their balance sheets, which will reduce their appetite for sovereign paper, where will the money come from? The combination of EFSF and ESM? But the funding for the EFSF and ESM come from the eurozone sovereigns. Can they loan money to themselves? What about the IMF? There was some discussion that some sovereigns, e.g. Germany, could lend to the IMF, which when then lend it back to troubled European country, e.g. Italy. However, the total amount of that facility amounted to €200 billion. The size of the ESM, EFSF and new IMF facility is simply not enough. It's like sending out a riot squad of 10 police officers with helmets and batons to face an angry mob of a thousand people. If the mob stampedes, the results won't be pretty. What about the ECB? Mario Draghi made it clear that the ECB would cap bond purchases to €2 billion a week (when actual recent purchases have amounted to roughly €1 billion a week). The total cap adds to about €1 trillion a year, which could be a big bazooka if it was un-sterilized. However, such intervention would be sterilized, which begs the question of where the money to buy the ECB's sterilized paper would come from. This analysis tells me to be prepared for more volatility and crisis summits in 2012, if not before. While policy is decided centrally, actual enforcement and implementation of that policy is conducted on a national central bank (NCB) level. Watch the stocks of stressed banks. There are four that appear to be under severe stress from a list that I detailed previously here. The first is Commerzbank, which has already undercut its Lehman Crisis 2009 lows and is in the prospect of testing its recent lows as another support level. If that low doesn't hold, then that may be one of the first Signs of the European Banking Apocalypse. I would also watch the shares of Credit Agricole, which has also been subject to rumors of severe banking problems. Societe Generale, another French bank, has also been the subject of insolvency rumors. In all cases, these banks have undercut their 2009 lows in 2011, but SocGen shares have managed to rally above that level. There are a number of other troubled bank stocks to watch, but these have not undercut their 2009 lows. In no particular order, these include the Royal Bank of Scotland, KBC, Unicredit, BNP Paribas and Banco Santander. Imagine that a man (the "eurozone") experiences severe chest pains and looks like he is headed for a heart attack ("Lehman moment"). The protocol is well defined in these circumstances. Take steps to stabilize him ("inject liquidity via the ECB") and then address the causes with a program of diet, exercise and medical treatment ("longer term solutions such as balanced budgets, pro-growth policies, possibly closer fiscal integration, two-speed eurozone, etc."). Berating him about being lazy and overeating ("you lazy Greeks, Italians...") and making him get on the treadmill to work off his Thanksgiving feast ("more austerity and IMF monitors") while he is on the verge of a heart attack ("Lehman like financial crisis") is less than helpful under the circumstances. If the ECB was supposed to be the Emergency Room doctor, then yesterday's decision by Mario Draghi to rule out further bond purchases was like throwing the patient out on the street with instructions of "take an aspirin and call me in the morning." What's more, the patient's family then gathered around to berate him for his bad habits over the years and forced him to get on the treadmill (the latest Grand Plan for greater fiscal integration) in order to lose weight and improve his health. The markets promptly responded and Italian 10 year yields shot up an astounding 47 bps. Instead of a combination of fiscal and monetary policy to save the eurozone, we now have to rely purely on fiscal policy. Will a new Brussels-on-the-Rhine, even if it were to be ratified by the eurozone governments, be able to do such heavy lifting without plunging Europe and the rest of the world into a deep recession? There is a tool from The Economist that allows a user to specify economic assumptions, i.e. GDP growth, budget balance, interest rates and inflation, for a country's to see what is needed to stabilize national debt-to-GDP ratios. When I played around with it, getting from A to B looks a tough task once you assume the recessionary effects the combination of an austerity program and credit crunch. (If the tool below doesn't work, try this link instead). The markets had been focused on ECB action to buy the eurocrats some time to fix the long-term problems. Now, we have a credit and liquidity squeeze occurring in the European banking system that is technically insolvent. These issues need to get addressed now. As I write these words late Thursday night, it appears that the latest Grand Plan is already falling apart. Maybe Merkozy and the eurocrats can pull a rabbit out of the hat, but I am not optimistic. The markets are going to take this very, very badly. * In the past, I mistakenly referred to the December 9 EU Summit as the Marseilles summit. It is being held in Brussels. I apologize for the error. Lately, this blog has been focusing on all Europe, all the time. I wanted to step back and write about something else. With an election year coming up in the United States, immigration is one of those hot-button issues that has been dividing people. But the electorate has to remember that the immigrant experience is part of the American Dream of rags to riches. The trend toward rising barriers to immigration, legal and otherwise, is also raising barriers to job creation and, longer term, barriers to the nurturing of human capital in America. [T]wo foreign workers with the Mercedes-Benz and Honda auto assembly plants in Alabama have run into problems. On Nov. 16, a German manager with Mercedes-Benz was arrested under the law in Tuscaloosa for not having a driver's license with him while driving a rental car. Last week, a Honda employee from Japan was detained under the law in Leeds. Police at a roadblock found him carrying an international driver's license and passport, but not an Alabama license or Japanese license as required by the law. Great way to attract employers to locate in your state, guys! Auto assembly plants produce jobs - good paying jobs. Stunts like that give locales a reputation for being difficult to do business. Where does "American" brain power come from? Since September 11, America’s increased concern with security has threatened to undermine its ability to attract global talent. Foreign-born scientists and engineers provide a critical element of America’s talent base: in the last decade, more than half of all Silicon Valley start-ups were launched by immigrants. In 2007, I warned that by making itself less hospitable to immigrant students, scientists, and entrepreneurs, the United States was undermining its own interests. "What if," I asked, "Vinod Khosla, the co-founder of Sun Microsystems and venture-capital luminary who has backed so many blockbuster companies, had stayed in India? Or if Google’s Sergey Brin had decided to apply his entrepreneurial talents in Europe?" Blueseed, a Silicon Valley start-up, is trying to do an end run around the broken immigration systems by dreaming up a "floating startup incubator." It would circumvent immigration laws the same way that gaming businesses once avoided gambling restrictions, by parking their clients on a ship in international waters. Has it come to this? Trying to figure out ways to game regulations is not a path to long-term sustainable competitiveness. The New York Times recently reported that Despite Economic Slump, Europe Gets More Tech Start-Ups (h/t FT Alphaville). Is this a tipping point? Is the American electorate being penny wise and pound foolish when it comes to immigration? Is this another American step towards being Argentina? We shall find out after this electoral cycle. Stocks and the euro rose after Merkel and Sarkozy said that Europe’s two biggest economies were aligned on backing automatic penalties for deficit violators and locking limits on debt into euro states’ constitutions. The French leader said they aimed to reach consensus on the changes required by March. It looks like Merkel got everything she wanted and the French went along (see the analysis from FT Alphaville). The French and Germans agreed to a Brussels-on-the-Rhine, with hard constraints and penalties for member countries who deviate from the True Path. How do they get all the other countries (i.e. the Dutch, Finns, Irish, Belgians, etc.) to agree to permanently giving up a this level of fiscal sovereignty? What countries have to agree? All 27 EU countries or just the 17 eurozone countries? Haven't we moved past Greece already? Well, no. Based on reported holdings of Greek debt in the European banking system, the implied losses on Greek debt alone are now enough to put many European banks into capital shortage. Europe could solve Italy's issues tomorrow and European banks would still face a banking crisis. Who will get to be the monitor for transgressor countries? The European Court of Justice only gets to decide if a country is in breach of its targets, but will not monitor compliance. Who gets that lovely job? What I believe our economic and monetary union needs is a new fiscal compact – a fundamental restatement of the fiscal rules together with the mutual fiscal commitments that euro area governments have made. Just as we effectively have a compact that describes the essence of monetary policy – an independent central bank with a single objective of maintaining price stability – so a fiscal compact would enshrine the essence of fiscal rules and the government commitments taken so far, and ensure that the latter become fully credible, individually and collectively. We might be asked whether a new fiscal compact would be enough to stabilise markets and how a credible longer-term vision can be helpful in the short term. Our answer is that it is definitely the most important element to start restoring credibility. Will Merkel et al agree to the ECB printing? Europe doesn't face a liquidity problem. It faces a solvency problem. What investors really want isn't just for someone to buy distressed European debt, but for someone to buy that debt and willingly take a loss on it so the money doesn't ever actually have to be repaid. That isn't going to happen easily. Short of major fiscal improvements in Europe (which appear increasingly hopeless in the face of an oncoming recession) any solution will have to explicitly or implicitly impose losses on someone. In my view, the best "someone" is the investors who willingly made the loans in expectation of earning a spread, and who knowingly took a risk. The worldwide hope among these investors is that the "someone" taking the hit will instead be the German people, but Germany remains resolutely against printing permanent new euros in order to effectively redeem the debt of Italy and other countries. Despite hopes that the ECB will suddenly shift its policy on this, I continue to expect that any ECB purchases of distressed European debt will follow an agreement on European fiscal union, and that even if initiated, will be on a smaller scale than investors seem to hope. Without airtight fiscal credibility among distressed Euro-area countries, whatever debt purchases the ECB makes will be almost impossible to reverse. There are still many moving parts to this Grand Plan that have to come into place before we can all celebrate. Are we destined for a repeat of the October experience where as we approached the G20 summit, the market rallied on leaks of the details of that Grand Plan for the EFSF? By the way, where is the state of the EFSF today? Hence, some caution is warranted. Last week, my client accounts were at 60-65% equity exposure. But on December 1, the tactical component of our portfolios flipped from 100% equity to 100% bonds. It might be bit early to become to defensive, as the year end rally shows no signs of letting up just yet. However, in secular bear markets, capital preservation and risk management should be every investors first priority. Hence, Investors are advised to watch the quality of this rally — the volume, the market internals, the reaction to news events — and position themselves accordingly. We may be in a situation reminiscent of 2008, as described by Kyle Bass, where the markets do not respond until it actually goes over the cliff. See this rather long video here, where he described the situation in 2008 where senior Lehman bonds were trading at roughly 400 bps over Treasuries a week the firm imploded, when the Treasury Secretary stated emphatically that Lehman was not getting bailed out. One day before the firm went under, senior Lehman bonds were trading at only 700 bps over Treasuries. Don't get overly distracted by the eurocrat discussion about how the longer problems are getting solved (which they don't appear to be). 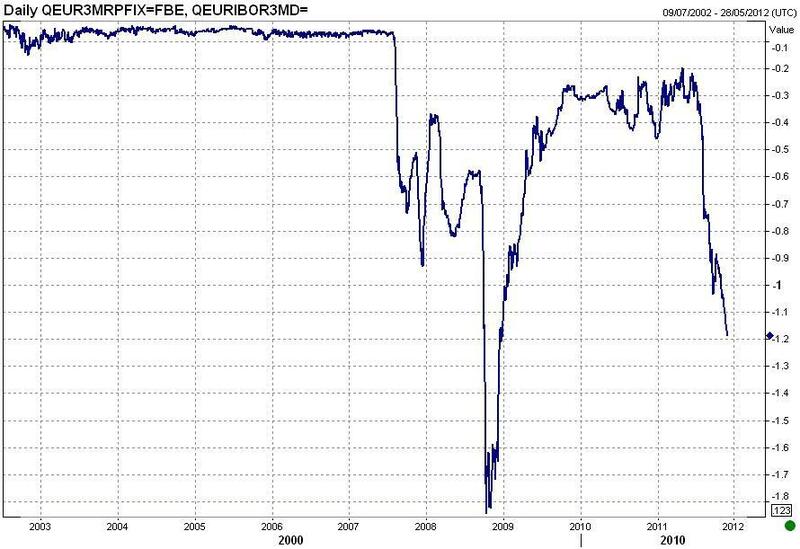 Hussman wrote this week that a Greek default alone is enough to sink the European banking system and the story about the potential Standard and Poor's downgrade of European sovereigns is just a shot over the bow. Pay attention to both the short and long term issues facing Europe.